So you want your child to play golf and love it as much as you do? Well, just like you, he or she won’t enjoy it too much if it feels cumbersome or frustrating. But there’s one way to avoid many of the pitfalls of play, and that starts with choosing the proper gear. Outfitting your child with equipment matched to his size and skill level will help him be successful, paving the way for a true appreciation for the sport and many rewarding afternoons on the course. It may be tempting to dig an old set of clubs out of the garage, cut them down to size, and add some new grips, but that is a recipe for disaster. It might be easy on the wallet, but it will do nothing to build confidence in your child. For instance, a down-sized golf club will not have the flex your child needs to loft the ball into the air. The heavier weight will also affect his or her back swing. There is good news, though; it’s not likely you’ll have to buy a full set of clubs for your son or daughter. Consider starting a child, age 5 or younger with one club, like a 7-iron. If your child is between the ages of 5 and 10 (or new to the game), he or she can get by with a kid's driver golf club, a wedge, a 5-iron and a putter; or simply select a junior set that features the basics. Beware the temptation to buy clubs a little on the big side and have your child “grow into the clubs.” If your child is right on the cusp between two sizes, then this strategy may be okay, but don’t stretch too far. Clubs that are too long will create problems with form that may be hard, if not impossible, to undo down the road. If your child has to “choke up” more than one inch to swing properly, the clubs are too long. Choosing the right ball for your child to play with is almost as important as getting the proper clubs. Many characteristics of adult balls will not yield satisfactory results for children. Most young golfers have swing speeds under 80 mph. At those slower speeds, he will need a softer ball with lower compression to get the ball up in the air and keep it going in a straight line. There are several kid-friendly versions to consider that come in a variety of playful colors, but there are also numerous adult balls that offer the same qualities. When you see the look of accomplishment on your child’s face when the ball is hit high and straight, you’ll realize just how important the choice of a ball turned out to be. Part of the grand tradition of golf is found in the attire. Rules vary from course to course, so you should check specifics before heading out to play. 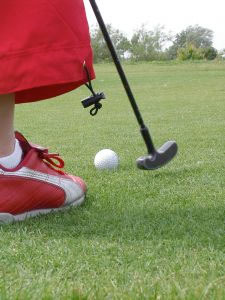 However, you can easily take a cue from adult golf clothing etiquette that will safely apply in almost every situation. A collared kid's golf shirt (preferably tucked in). Look for fabric that wicks sweat away and allows for open movement. Kid's golf pants or kid's golf shorts (beware: some courses do not allow cargo shorts or extremely baggy styles). Collared shirts (with or without sleeves). Shorts or skorts, but do check on inseam requirements. Other clothing items you may want to consider are those that help keep the child comfortable in all sorts of weather. Children are often undaunted by the rain, but on a cool spring day, you won’t want to make them quit mid-course, nor do you want them soaked through. An easy solution is to carry a lightweight water and wind resistant jacket. It protects from the rain outside and wicks away moisture from the inside. Extend play in early spring and late fall by adding a layer of warmth underneath clothing, such as thermal underwear for boys and girls. When kids are warm and comfortable, they can concentrate on the game. Last but not least are the shoes. Most courses do not require golf shoes, but the athletic shoes you choose should be comfortable to withstand the walking your child will be doing. Thick, athletic socks can also add to his or her comfort level. The spikes on golf shoes can help keep the foot from sliding, but if you do decide to go this route, make sure not to buy the shoes too big. This is another case where it is not a good idea to buy large with the goal of stretching the life of the product. A love of the sport begins with early success, which can only come from proper preparation. Do your homework and then reap the rewards.